Researchers Teach Soy Tricks To Appeal To Indian Tastes : Shots - Health News Salty snacks are increasingly the bane of health experts looking to head off childhood obesity in the U.S. But in India, researchers are trying to get more salty snacks into kids' hands – snacks that from the outside look a lot like Cheetos. Salty snacks of the junk food variety are increasingly the bane of health experts looking to head off the stubborn childhood obesity epidemic in the U.S. But in India, researchers are looking at ways to get salty snack foods into kids' hands – snacks that are secretly healthy, vegetarian, and protein-rich. Why? Because In 2009, the United Nations World Food Program found that a fourth of the world’s hungry, or 230 million people, live there. And some 43 percent of the country’s children under five are underweight. Think of it as an Indian version of a cheese puff-- a crunchy, fluffy, tube-shaped snack that delivers a big hit of salt -- with a couple of twists. 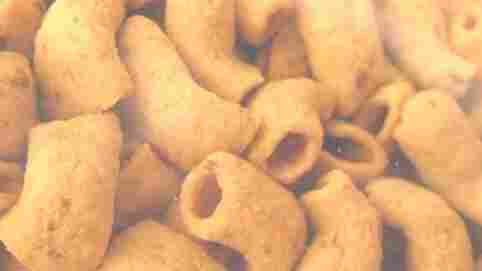 While Cheetos are made mainly with cornmeal, the Indian snack has a critical ingredient: protein-rich soy, something not often found in Indian foods. It’s also covered with spices like cumin and red chili pepper to appeal to local tastes, instead of electric orange cheese-flavored power. The project is the brainchild of Soo-Yeun Lee, a professor of sensory science at the University of Illinois at Urbana-Champaign. She works a lot with soy, making functional foods - foods fortified with particular nutrients -- more palatable. After traveling to India, she was shocked by the number of hungry kids there, and thought she might be able to lend a hand. Indians, an estimated 40 percent of whom are vegetarian, are especially hurting for protein – it makes up only nine percent of the average per capita caloric intake. (The U.S. Institute of Medicine recommends that 10 to 35 percent of daily caloric intake come from protein.) But the country is also the fifth largest soybean producer in the world, most of which is exported. Dr. Lee sees this as an opportunity. "Soy is a high-quality protein and it’s cheap, so they have all the right reasons to use it," says Dr. Lee. The problem was, she found, the flavor. Dr. Lee teamed up with the Akshaya Patra Foundation in Bangalore to test out the product she developed in her lab. It got high marks from a panel of 67 taste-testers in Bangalore, as well as from a panel of 72 Indians living in Illinois. She published results in the Journal of Food Science and the Journal of Sensory Science this summer. Akshaya Patra plans to distribute the product with its school meal plan and sell the curry snack in local stores.